For some reason, I’m drawn to the colors blue and white. I LOVE them together. I find this color combination crisp and clean but also very elegant. It may be my love for the ocean that attracts me to blue but I especially LOVE the shade of indigo. 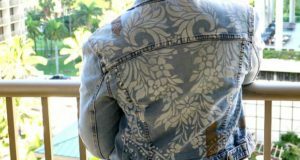 The color of my favorite worn pair of jeans, Bristol Blue glass (I fell in love with during my years studying abroad), English pottery and nautical motifs. 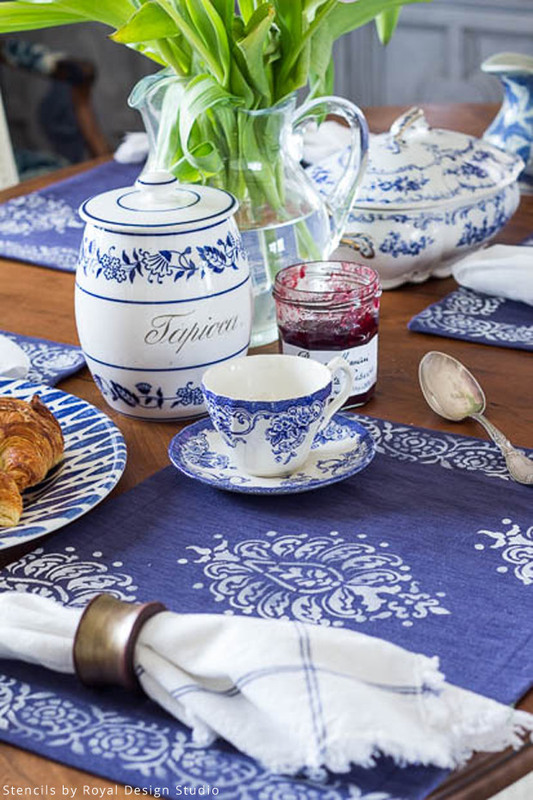 I knew I wanted to create indigo placemats for my home for spring. Are you a blue person too? If so, you’re in luck! 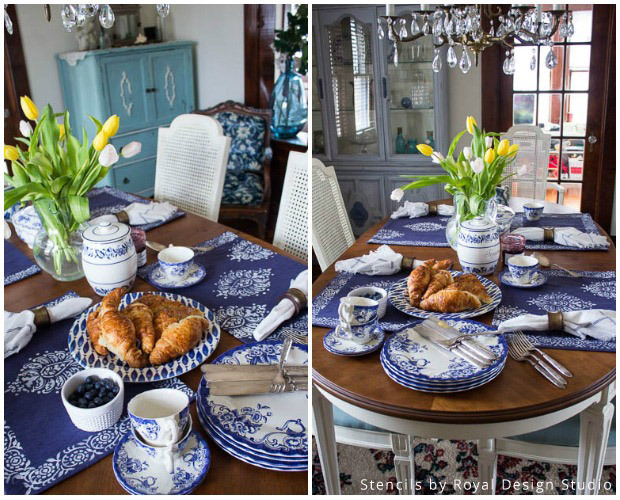 I will show you how I made these pretty indigo stenciled placemats to complete my spring tablescape theme-AND it didn’t take me very long at all! 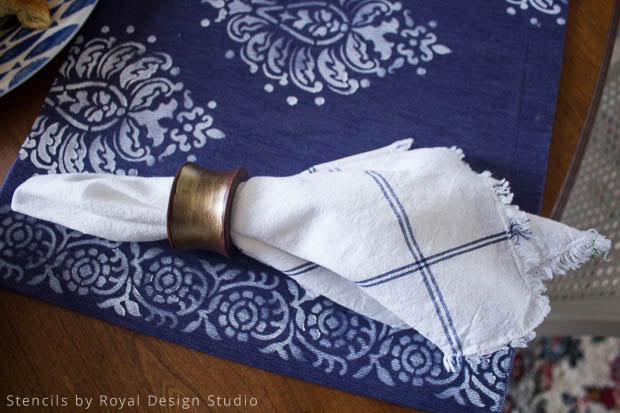 Resources: Indigo Khadi Placemats from World Market, Wooden Napkin Rings from Pier One. 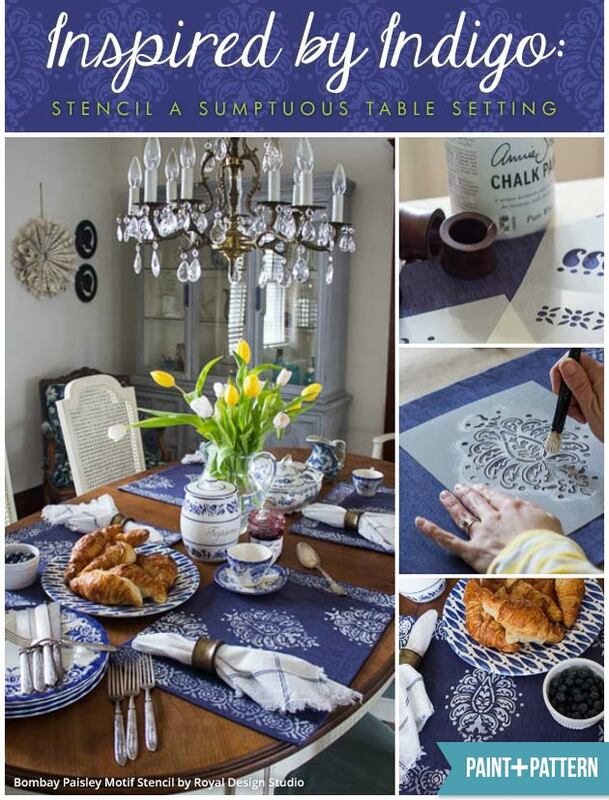 Step 1: Lay your placemats out with the stencils to decide how you want to position them. 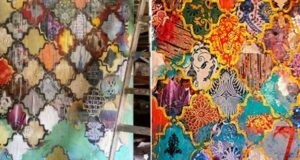 The great thing about the Sari Border Series stencils is that there are so many options for different stencil ideas. There are five designs in all. I chose one with flowers that had some swirl element similar to the Bombay Paisley stencil so that they would coordinate well. For variety I decided to stencil two different versions of this placemat. Version one has the Bombay Paisley Motif stencil in the center with a border all the way around it. Version two has the Sari Border on two sides and the Paisley Motif in the center and coming off the placemat in the left top corner, and the right bottom corner. Use a measuring tape find the center of the placemat to center the stenciled motif. Step 2-Basic stencil technique: Tape the stencil in place to make sure it doesn’t move. Dab just the tips of the stencil brush into the Pure White Chalk Paint and pounce or swirl the brush on a paper towel to remove the excess paint. 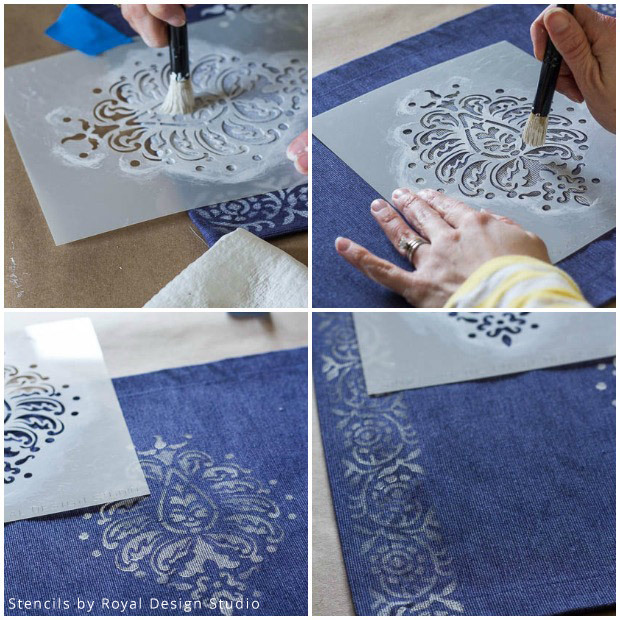 Stencil the fabric using a circular motion with the brush. 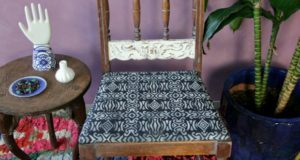 Finish: Once you’ve finished stenciling all your placemats you can “set” the paint to the fabric either with a hot iron and pressing cloth for a minute. Or, place in a dryer on the highest setting for 30 minutes. These placemats are handspun and handwoven from India and have such a rich color. The fabric very absorbent so I had to go over the stencil 2­-3 times for each area to get a deep color. I love how the color seems to fade in and out a bit, though. It really brings out the character of the dyed indigo look that I love. I thought my wooden napkin rings needed a little sparkle to pair with the gorgeous blue and white placemats. Royal Design Studio has a metallic stencil crème paint that is not only ideal for stenciling, it can also be used as a high covering metallic paint over furniture and accessories. 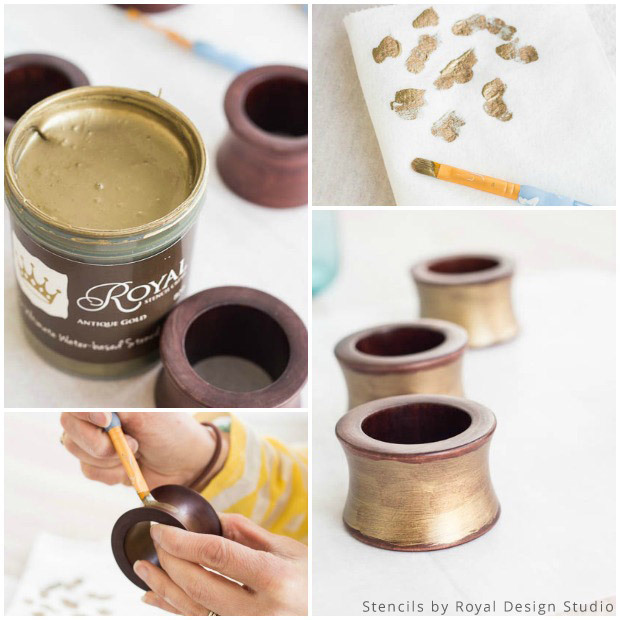 I used a small paint brush blot some Antique Gold Royal Stencil Creme to the wooden rings. You don’t have to use very much. A little goes a long way! Even though I don’t enjoy measuring, I think it is essential for lining up the paisley in the middle. I wouldn’t eye ball it! 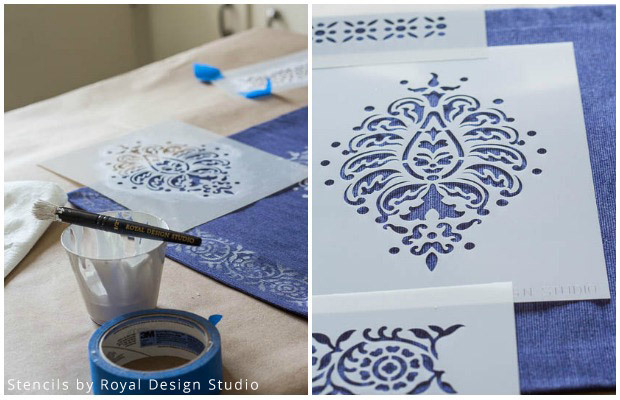 Make sure to secure your stencil with tape, it can slip easily on the fabric placemats. Removing the excess paint from your stencil brush prevents bleed from seeping under the stencil. It is good to have many good quality paper towels on hand. Remember to iron your place mats to heat seal the design! 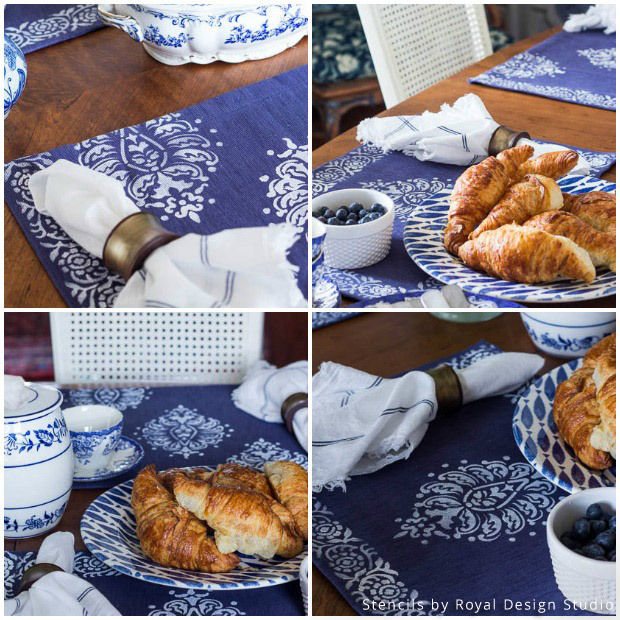 I so enjoyed using these new stenciled indigo placemats in getting my dining room ready for a blue and white brunch! To add to the informal atmosphere I mixed and matched nautical, almost hand stamped, dishes with fine English china that I’ve collected over the years from antiquing trips. The linen napkins I found up in Canada. The croissants were from a local French bakery and, just as in France, they were buttery and delicious. My little boys so loved eating them! I hope this gave you some ideas to mix and match different stencils and even use different designs and textures in one tablescape! Will you try to make these for your own home? I guess the more important question is who will you be inviting over for tea? So beautiful! I love those stencils together too! Beautiful! Does the chalk paint come off when you spot clean the placemats? Nope! 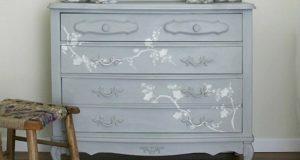 Annie Sloan Chalk Paint is durable for years and years! I’d love to try those stencils on canvas with acrylic paint. Add several layers of 2 close colors (like blue and purple, or red and orange) of paint using the stencils, and let the paint mix in to create marbling effects. I’ve used doilies to achieve this effect, but it ruins the doilies. Maybe a stencil like this would be more reusable? something totally, except this post gives good understanding yet. I blog frequently and I seriously appreciate your content.This article has truly peaked my interest.I’m going to bookmark your website and keep checking for new details about oncea week. I opted in for your Feed as well. Wonderful beat ! I wish to apprentice while you amend your site, how can i subscribe for a blog web site? Just over two years Palladium has been the best performer of the mainprecious metals this year, with prices up 3.5 percent since theend of 2012, compared with an 8 percent drop in platinum pricesand a 20 percent fall in gold. hi!,I love your writing very much! percentage we be in contact extra approximately your post on AOL?I require an expert in this space to resolve my problem.Maybe that’s you! Having a look forward to look you. Thanks for every other wonderful article. The place else could anyone get that type of information in such a perfect method of writing?I’ve a presentation subsequent week, and I’m at the look for such info.